Starring Sylvester Stallone, Matthew Modine, Meadow Williams, Ryan Guzman, Jenna Willis, and Christopher McDonald. Seven years after a botched bank robbery the sole surviving robber is given a drug to help him remember where the cash was buried. It is probably fair to say that Sylvester Stallone’s recent non-franchise movies have been a bit hit-or-miss, and with Creed II doing the business at the box office during the last month then now is probably the best time to either capitalize on that success with more product or slip something out under the radar while people are distracted by a bigger and better film, depending on your perspective of course. 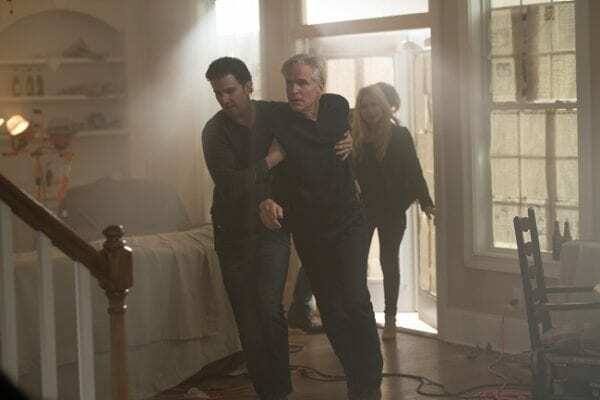 Backtrace is a very low budget thriller that, regardless of your perspective, can only fall into the latter category simply because it ticks all the boxes for the kind of direct-to-video movies that big names normally do between blockbusters, i.e. having its ‘star name’ not do very much apart from appear on the poster and put in roughly 10 minutes of screen time surrounded by other actors of lesser talent delivering a script that could have done with a few more passes through the writer’s room before being allowed in front of a camera; these things are direct-to-video for a reason. 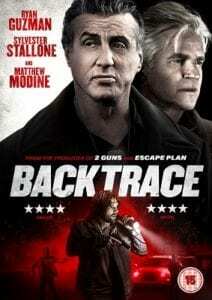 To be fair, Stallone is joined here by Matthew Modine – no stranger to bigger budget box office hits himself – and Modine pretty much carries Backtrace as Macdonald, a bank robber who, after stealing $20 million, is double-crossed by whomever ordered the job and left for dead after being shot. Roll forward seven years and Macdonald has been in custody, suffering from amnesia and unable to remember why he is there. Luckily some people show up to remind him that there is a considerable amount of money buried somewhere and he is the only person who could know where it was, and after breaking him out they helpfully pump him full of experimental drugs to help enhance his memory. The trouble is, Detective Sykes (Stallone) and FBI agent Franks (Christopher McDonald – Thelma & Louise) are still (yes – still!) working on the case and are closing in to recapture their man and discover where the loot is. So Sly yet again dons the role of a grizzled detective but Sykes is no Ray Tango or Marion Cobretti as he is barely given anything to do except stand in front of a huge board putting pins in various locations and try to work out this whole bank robbery debacle. Bear in mind that this is seven years after the robbery and the only man still alive connected to it has, up until this point, been in custody and you have to wonder why nobody from the senior ranks of the state police have come down and asked what everyone has been doing. Add to that that Sykes is clearly several years older than all of his colleagues and questions form about why Sykes hasn’t been promoted to a position of authority yet – he seems fairly easy going and everyone except the FBI seems to like him so perhaps there’s an idea for a prequel? But given how uninteresting Sykes is and how uninterested Stallone clearly is, perhaps not. Anyway, Backtrace is full of similar plot holes that ask more questions than it answers but to get the most out of the film it is best not to think about it. 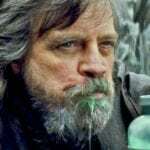 However, despite the obvious flaws in script, logic (Sykes’ final act of the film is absolutely not what any police officer who has been working on a case for seven years would do and pretty much writes off the whole thing as pointless) and acting ability from the supporting characters there are a few shining moments to grasp onto, such as Matthew Modine being the only actor to clearly give a damn and put in a spiritied performance that makes the troubled Macdonald fairly sympathetic – no mean feat given that he is a criminal introduced to us post-robbery – and the shoot-outs are fairly well paced and a bit more exciting than the usual direct-to-video style but the rest of the direction and performances – such as that of Joe Gelchion as the almost-laughably unconvincing Captain Stover, whose gravitas next to Stallone is near-enough zero despite playing his superior – are very flat and unimpressive. It is highly unlikely that Sylvester Stallone needs the paycheck and is probably just doing somebody a favour by appearing in their movie – either that or somebody somewhere has something incriminating against him – but whatever his reasons for doing it Backtrace is, at best, a mediocre thriller with a tangled and puzzling plot that you’ll likely only watch once because Sylvester Stallone is on the poster and you simply must see everything that he is in. If that is the case then do it once and forget about it, as Sly himself probably aleady has.